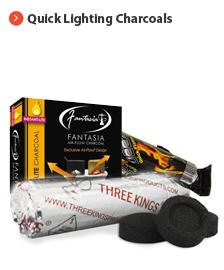 Hookah Charcoals are specially formulated and are intended to evaporate the Flavored Tobacco during Hookah smoking sessions. Hookah Charcoals come in quick lighting, semi quick lighting, and non quick lighting styles, and all three versions are considered to be very popular. Quick lighting charcoals are generally easier to use, and can quickly be lit using a torch lighter or direct heating source. Quick lighting hookah charcoals are odorless, as well as tasteless, and do not interfere with the quality of the smoke. Semi quick lighting Hookah Charcoals are easy to use but require the extended use of a torch lighter or direct heating source. 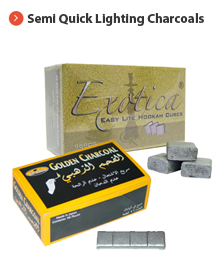 These Hookah Coals typically come in silver sticks that are square shaped and are generally used among the avid and more experienced Hookah smokers. Non quick lighting charcoals are generally used in Hookah Lounges and among the avid and more experienced Hookah smokers. These charcoals are usually heated using an industrial stove or burning device and typically last longer than quick lighting charcoals.